Terms we use at here at PedalSnake.com, regarding guitar effects pedals, amps, noise, and tone. Like small headphone plug (aka 3.5mm). Some pedals use this type connector to receive power. PedalSnake P-Lines are all standard 2.1mm, but PedalSnake Power Plug Adapters will adapt to any power plug size for pedals, and for power supplies. See Power Plugs Sizes. 2.1 barrel connectors are the standard power plug size for pedals (used by Boss, Ibanez, Dunlop, etc.) PedalSnake also uses 2.1 on all its P-Lines. PedalSnake Power Plug Adapters will adapt to any power plug size for pedals, and for power supplies. See Power Plugs Sizes. 2.5 barrel connectors look just like 2.1, but the center pin (hole) is larger (2.5mm). A standard 2.1 plug wont fit into a 2.5 pedal. A 2.5 plug fits loosely into a 2.1 pedal, making little or no contact between hole and pin. PedalSnake Power Plug Adapters will adapt to any power plug size for pedals, and for power supplies. See Power Plugs Sizes. Like a small headphone plug (aka 1/8" miniphone). Some pedals use this type as a power connector. PedalSnake P-Lines are all standard 2.1mm, but PedalSnake Power Plug Adapters will adapt to any power plug size for pedals, and for power supplies. See Power Plugs Sizes. 9V battery pedal A pedal that accepts a 9V battery, though it may have a power input jack too. 9V battery pedals are important for designing your P-Lines and power-chains, because they typically draw only 10-20 mA of current. So 20 or more can be powered on a standard P-Line. See Pedal Current Categories. AC-powered gear This is is gear (like amps) that are powered by 120VAC (wall power). They plug into the wall with a 3-prong grounded AC power plug (the 3rd center prong is for earth ground, any gear powered by "2 prongs" or an isolated power supply is not considered to be AC-powered gear.) The earth ground is for safety only, and not intended to carry current, so all input and output jacks are grounded to the metal chassis which is tied to earth ground (but "ground" is not always "ground"--see different ground points). See Grounding and Hum. The back of a performance stage where players put gear like amps, racks, etc. (as opposed to the frontline where performers stand over their pedals). PedalSnake is designed to replace all cables running between pedals and amps, from the frontline to the backline. Those little power connectors for pedals that have a hole in the end of the plug on the power supply's cable, and a matching pin inside pedal's power-In jack. See Power Plugs Sizes. The Base Snake the long, thick multi-channel cable that serves as the backbone of a PedalSnake System. All guitar rig lines run from pedals (frontline) to amp (backline) using channels within the Base Snake. Channels are configurable with plug'n'play Pigtails. See Base Snakes. Marketing gimmicks about "tone" often lead us to begin "hearing with our eyes". A blindfold test can find out what is important and what isn't, like "do I really need a $100 guitar cord?" Find one and test it against a decent $25 cord---but do it blindfolded. The "tester" secretly names the cords "A" and "B", and switches between them whenever the "testee" (listener) asks while trying to hear a difference. You'll be surprised how many folks can't pass. The point is, quit listening to marketing claims and find our for yourself. Save your money for stuff that really affects tone (your amp being the most important thing). A pedal which is "always on" (the opposite of true bypass). Most pedals today are buffered, meaning a buffer circuit is always on, even if the pedal is turned off (this is why you have to unplug the input cable on buffered pedals to save the battery). Good buffers drive cable capacitance better than a guitar pickup, so you can have as much as 50-60 feet of cable downstream (after the output) before you start losing tone. See True Bypass Truths, and Preserving Tone. This is the standard polarity for barrel power connectors, but it was not a good standard to adopt. It means the center "hole" of a barrel plug is ground (negative), and the outer "barrel" of the plug is "hot" with the pedal voltage (like 9VDC). Since the metal of the outer barrel is exposed, it can short out against any grounded metal in your pedal area, like the metal shell of a guitar cord plug. This will kill the power, and your sound. So, if you have unused center-negative plugs on a power-chain, cover them with an insulator, like a small plastic bag. Don't use adhesives (like tape), because sticky residue will be left behind when you use that plug, causing a poor connection. One of several color-coded wire-groups accessible at each end of a Base Snake, used to make lines for your guitar rig. Use channels by themselves for DIN-plug applications (like MIDI lines). Make 1/4" G-Lines or 2.1mm P-Lines by adding plug n play Pigtails to channels. See PedalSnake's Channels and Line Types. As opposed to a wall wart, where the supply itself plugs into the wall, a chassis supply is a free standing box, usually meant to go on a pedalboard. They usually require 120VAC run out to the board (what a pain), and have multiple power outputs for pedals on the board. See Power Supplies. The 2nd best conductor among metals (silver is #1). But copper is not the metal the industry chose to be a standard for electronic connections---they chose nickel. The standard exists because using mating connectors of the same metal prevents galvanic corrosion (see dissimilar metals). People are led to believe that high conductivity (low resistance, like copper) is important in audio signal cables. It is not. Capacitance and corrosion are far more important. Conductivity becomes important with heavier lines, like speaker cables. current categories To simplify P-Line design, PedalSnake defines 3 Current Categories for pedals. For details, see Pedal Current Categories. This is the actual amount of current that a pedal draws from its power supply (or battery) when its on. It is usually only a fraction of its power supply's current rating. 9V battery pedals can have power supplies rated at 200mA, but draw as little as 4mA (average is about 20). Some pedals draw over 1000mA. It is good to know (or estimate) current draw when deciding how many pedals to put in a power-chain with one power supply. To get the accurate current draw of pedal, try to find it on the Power List. To estimate, you can use Pedal Current Categories. Also see Choosing P-Lines. "Current Rating" applies to a power supply, not a pedal, telling you how many "mA" (of current) that supply can safely deliver. Pedals draw only a fraction of their power supply's current rating. If the rating is exceeded by having too many pedals in a power-chain, or by using the wrong supply, the supply may overload. Try removing some pedals, and putting them on a 2nd chain and supply. PedalSnake uses the current rating of a pedal's supply to define 4 Pedal Current Categories, which can be very helpful in designing PedalSnake P-Lines and power-chains. Every rig has at least one ground point (and hopefully only one). In order to teach proper grounding in pedal rigs, we say a "different ground point" is any point in your rig with a different ground from your amp-input jack (primary ground). You see, "ground" is not always "ground". Power transformers in 120VAC-powered devices (like amps) can induce small voltages into the amp's metal chassis, and it is no longer earth ground (0 volts). One amp chassis can even have different ground points---like with some tube-driven FX loops! If different grounds ever get connected, hum can result from ground loops. The solution is to keep different ground points in your rig isolated from each other. Use enough isolated power supplies, power chains, and other devices like isolated A/B boxes, etc. 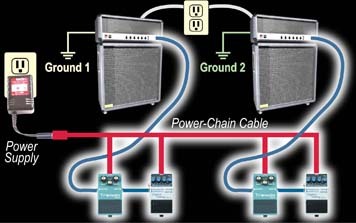 (power chaining across audio-chains at different ground points in the #1 culprit). See Common Different Ground Points. To know what to do about your rig, take a few minutes to do our Simple Hum Test. A type of connector, like those used on PedalSnake channels and MIDI cables (not to be confused with "mini DIN", like on computer gear). There are several DIN connectors with different pin counts, but PedalSnake uses only 2 to make 3 different types of channels. See Channel Types. Can also be called "different metals". It is best to avoid mating connectors made from dissimilar metals. This speeds up galvanic corrosion (like rust), which will eventually cause a "crackling" or failed connection. Since your gear has nickel connectors (the industry standard), use standard nickel plugs on your cables (not gold, despite marketing myths---both sides of a connection have to be gold to realize the benefits). Also see Pedalboard Failures. A G-Line Pigtail 2-Pack that gives you 2 G-Lines from one Base Snake channel. Perfect for FX Loop Send and Return, and for wireless out and back. See Avoiding Hum in Dual G-Lines. A Pigtail 2-Pack that gives a PedalSnake user 2 lines from one Base Snake channel. A Pigtail 2-Pack that gives 2 P-Lines (and 2 pedal voltages) from one Base Snake channel. See Avoiding Hum in Dual P-Lines and the simple Hum Test. The only true ground is mother earth, which is considered to truly be 0 volts, and always safe. This is not true of all "grounds". To make an earth ground for electrical wiring in buildings (or a lighting rod), a copper stake is driven deep into the ground, and the electric panel is grounded to the stake. AC-powered gear, like guitar amps, have all their input and output jacks grounded to the metal chassis, which is tied to earth ground via the 3rd center prong on the power plug. But power transformers in AC-powered gear can induce small voltages in the chassis, creating different ground points which are no longer true earth ground (0 volts). See Different Ground Points and Grounding and Hum. The distance the individual channels stick out past the black outer jacket of the BaseSnake. This gives you an idea how far the channels will spread to reach different connections. Standard BaseSnakes have a 12" fanout length at both ends (so the black outer jacket of a BaseSnake is 2 ft. shorter than the stated length for that BaseSnake). Plugging a Pigtail into a channel adds about 15" to the effective fan length. Custom PedalSnakeCS models can be ordered with larger fanout lengths, but is it better to use short extensions than to order fans longer than 24". Long fans are hard to coil up. The line, or cable, that connects to a footswitch. Footswitches come with some amps to change channels, turn FX on and off, etc. They are typically a pedal-type box with one or more "on-off" buttons. Footswitch lines can go in PedalSnake too. This is easy when footswitches have cables that detach (like Mesa). Footswitches with permanent lines won't plug into PedalSnake's all-male plugs (see Footswitch Modifications). See what types of connectors PedalSnake supports, see Footswitch Lines. Some footswitches have a cable with a male plug permanently attached to the footswitch box, so a modification may be needed for proper mating to PedalSnake's male plugs. The best thing to remove the cable, and install a female jack in the chassis of the footswitch. Then any appropriate cable, or any appropriate PedalSnake line will work (see Footswitch Lines). Some companies like Mesa and Fender already offer "cable-less" footswitches with chassis jacks. If you can't modify the footswitch yourself, and you can't find a qualified tech to do it, there are other options like; 1) Use a coupler (female-to-female). Hosa makes a good one for 1/4" (GPP-105). or 3) Wire the male plug back on to the 12" cable and still use a coupler (above). front end This is preamp section of an amp, fed by an amp's main input. The front-end sends a preamp signal to the power amp that drives the speakers. A gain-master amp can get distortion from the front-end, may have an FX loop to send a signal out to effects, and return it to the power amp. Also see primary audio-chain. The front of a performance stage where guitarists stand with their pedals underfoot. PedalSnake is designed to replace all cables running from the frontline to the backline (between pedals and amps). "Effects Loop". The Send/Return FX Loop was developed for gain-master amps that can get front-end (preamp) distortion at any volume. The purpose of the FX loop is to keep time-based effects sounding good by putting them after the amp's front end distortion. A delay pedal going to the amp-input will result in "distorted delay", when "delayed distortion" sounds better. An FX Loop's Send comes after the preamp (and the distortion), so a delay pedal in the FX loop will delay the distortion and sound better. The same is true for other time-based effects, like chorus, tremolo, etc. Effects that change a signal's level, or amount of distortion. Compressors, fuzz, distortion, overdrive, etc. are examples. These FX should be placed in the primary audio-chain (not in an FX loop, where time-based FX belong). gain-master The term for amps that can get distortion from their front-end. A gain knob controls the amount of distortion, and the master knob controls the overall volume, so any amount of distortion is possible at any volume. Sometimes these amps have an FX loop between the front end and the power amp. This is a type of corrosion (rust) that slowly takes place when 2 dissimilar metals contact one another. If the contacts are not moved around periodically, it will eventually lead to a "crackling" or failed audio connection. This is the electronic industry has a standard metal for connectors. Nickel. So stick with guitar cords having standard nickel plugs (despite marketing claims of gold and copper). They match the standard nickel jacks on your gear. Also see Pedalboard "Failures" . A PedalSnake "GuitarLine" with 1/4" connectors, used like a "guitar cord". Made by plugging a G-Line Pigtail 2-Pack into both ends of a BaseSnake channel. On Custom PedalSnakes, G-Lines can be ordered "hardwired", with the 1/4" plugs soldered onto the line, so no Pigtail is needed. See G-Lines and the Channel-Pigtail Chart. NOTE: All Pigtails are 15" long. So if you have trouble getting your G-Line Pigtail to "climb a stack", or stretch between amps and racks, you can order custom 1/4" extension cables here. The 3rd best conductor among metals (behind #1 silver and #2 copper). Gold-on-gold connections are the most reliable kind---they never corrode---and can be found on the space shuttle, very expensive hi-fi gear, etc. But having gold on only one side of a connection may actually hurt rather than help (see Dissimilar Metals). See Galvanic Corrosion and Pedalboard "Failures" . Hum in audio systems (guitar rigs) is often caused by ground loops, which result from 60Hz currents that flow in the ground wires (shields) of audio cables that connect between different ground points. The most common cause of ground loops in pedal rigs is power chains. The illustrations below help you understand ground loops and isolation in audio systems. The highlighted area is the path ground currents take when power chains are the culprit. Use 2 different isolated supplies, and 2 different power-chains (see below). Isolated supplies have no ground by themselves---they adopt the ground of what they connect to. That's why we have them---they help us avoid creating ground loops. For more, see Dealing with HUM in our Guitar Noise Manual. Every guitar rig has one or more ground points. Every input and output jack on AC-powered gear (like an amp) can be considered a ground point, because jacks are grounded to the amp's metal chassis which is tied to earth ground. The problem lies when ground points are not at the same as the primary ground (this can even happen within the same metal chassis!) These different ground points are responsible for ground loop hum. See Ground Loops. Ground loops are the primary cause of hum in guitar pedal rigs. To avoid hum in your rig, see Grounding and Hum. If you get more buzz when you remove your hands from your strings, you need to ground your strings. Unfortunately, many guitar makers don't do this for you, so it becomes a popular aftermarket mod. To avoid electric shock, do it properly with a resistor and capacitor. Various websites sell these parts, and offer instructions. A Base Snake's white 5-wire channel. With an MF1-H Hi-Current Pigtail plugged in, can be used to power one hi-current pedal. This is what we call a pedal that draws a LOT of current from its power supply (see Current Draw). It is a loose definition, and usually applies to pedals that 1) Draw more than 500mA of current, or 2) A pedal that comes with a power supply that is rated at 1600mA or more. With PedalSnake, a Hi Current Pedal can be safely powered using an MF1-H Hi-Current Pigtail and the white 5-wire channel on a BaseSnake. Made with an MF1-H P-Line Pigtail 2-Pack and the white 5-wire channel in a BaseSnake, a Hi Current P-Line will deliver 1000mA of current before dropping 0.5V across the line. This comes in handy when powering Hi-Current Pedals through PedalSnake (see Pedal Current Categories). See Types of Noise . An easy way to see if you have any hum-causing different ground points in your rig. Just use the simple Hum Test. "Isolated" means "ground isolated", or "transformer isolated", meaning "no hard-wired connection between the input and output, especially no ground connection". The purpose of isolation is to prevent ground loop hum. Isolation usually refers to a power supply (it can also refer to transformer-isolated audio outputs, like those found in good stereo pedals and A/B Switchers, because they often connect to 2 amps, and ground loop hum can occur). In an isolated device, power (or signal) at the input is "induced" from input to output, across the air gap of a transformer. 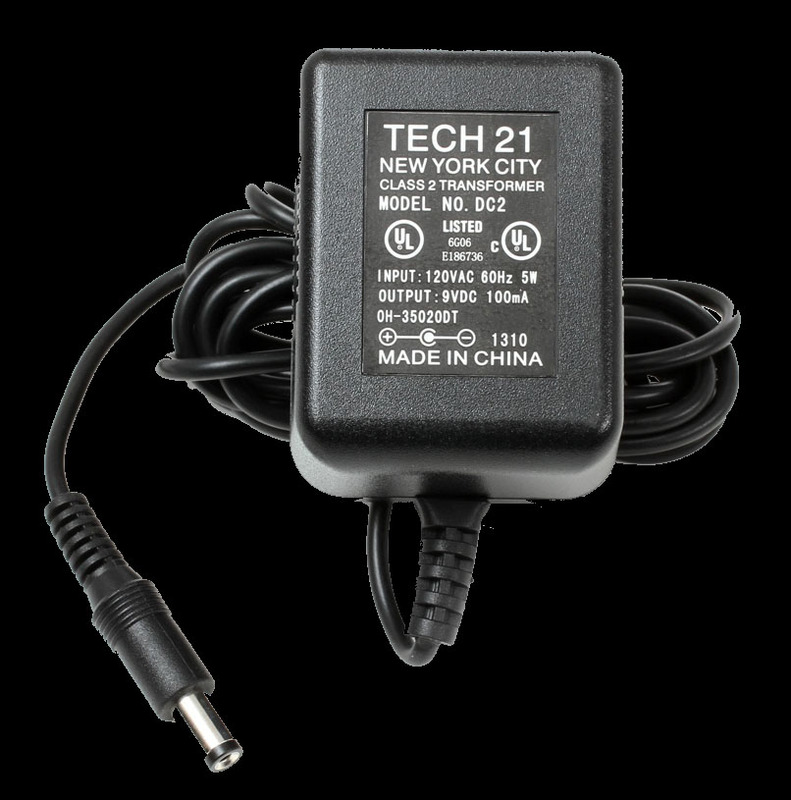 Isolated power supplies (like good wall warts) are usually better (quieter), and will usually say "Class 2 Transformer" somewhere on the label. Isolated supplies must get grounded when we use them. But this only happens after they connect to a pedal that is connected to a grounded AC-powered device (like an amp, with a 3-prong power plug). So, a single audio-chain of pedals, and the wall warts providing power to that chain, will all adopt the ground of the amp input the last pedal connects to. This is important to know when using a power chain. To learn more, see Avoiding Hum in Power Chains, Dual G-Lines, and Dual P-Lines. Lo-current pedals will not accept 9V batteries, because the current draw is too high. The battery would not last long. Power supplies for lo-current pedals are usually rated between 350 and 900mA. See Pedal Current Categories. A "cord" inside of PedalSnake BaseSnake that carries signal or power. On standard PedalSnake BaseSnakes, lines are made by plugging a Pigtail kit into a channel, Bare channels can be lines too, and Custom PedalSnakeCS offers some "hardwired" 1/4" G-Lines. For more, see Channels and Line Types. Modeling pedals by Line 6; having a 2.5mm power plug with reverse polarity (center + positive instead of center - negative). When using the Line 6 supply with a PedalSnake P-Line, use a 2125AR power plug adapter for the pedal, and 2521A for the supply. You can also use a standard 2.1mm, center-negative, 9VDC supply, but it must have a current rating of 500mA or more (like SnakePOWER). Then use 2125AR and 21RP for the pedal itself. Power Chains are possible when using our SnakePOWER (500mA rating) to power the Line 6. To be safe, try to keep the total current draw below 400mA (the Line 6 modeler draws around 270 itself). PedalSnake's "low voltage method" means low-voltage power is delivered thru PedalSnake, from your power supply to your pedals. This eliminates the 120VAC "power cord", and allows you to experience the magic of "one cable" for your pedal rig. Electronic devices are usually powered by a low voltage from a power supply instead of 120VAC from "wall power". In electronics, "low voltage" usually means 42V or less. While a few pedals require 120VAC from the wall, the vast majority require a low voltage from a power supply or battery (9VDC is the most common). medium-current pedals Pedals with power supplies rated between 1000 and 1600mA. The standard metal for audio signal and power connectors. When all connectors use the same standard metal, galvanic corrosion (and bad connections) are minimized. If you you need tons of gain (which increases noise), and can't afford better gear (few can), noise gates may be a solution for you. But they are not perfect solutions. "Gates" merely turnoff (or reduce) the sound (noise included) when you are not playing. This is effective, because noise is more noticeable in quiet moments. But, when playing resumes, the sound comes back, noise included. This is effective, because your guitar signal is usually much louder than the noise, and the noise is mostly covered up. But, the gating "on and off" of the sound can be noticeable, and---since the noise is still there when you play---sound and tone can be affected, even though you don't hear the noise specifically. See Types of Noise. This refers to power supplies, and happens when too much current is drawn from a supply, and usually noted by increased hum. Avoid overloading, because the increased heat may shorten the life of the supply. This is important to keep in mind when designing your power-chains. The same as an audio-chain: A chain of pedals where the guitar signal feeds from one to the next. The last pedal's output goes to some AC-powered device (like an amp). A pedal-chain is an important concept because each pedal in an audio-chain are at the same ground (which is the ground point of the outer metal jack at the signal input of the AC-powered device). This is useful to know in order to avoid hum. See Grounding and Hum. The order of pedals in a chain, from first input to the final output, can be important. See Pedal Order. The end of PedalSnake that goes at the frontline with the pedals. To facilitate setting up the patented "ultra-quiet" wiring scheme, PedalSnakes have labels for Pedal End, and Amp End too. This is the operating voltage of a pedal, usually supplied by a power supply or battery. Most pedals use 9VDC, but they vary up to 24V, and be AC or DC. You need one P-Line for each pedal voltage in your rig. For more, see Pedal Voltages. These are short 15" cables that plug into a Base Snake channel to form 1/4" G-Lines (for guitar signals) or 2.1mm P-Lines (for low-voltage pedal power). Pigtails makes PedalSnake plug'n'play, which is done guitar rigs change so often. Pigtails are easily added or swapped around. Sold in 2-packs, one for each end of a channel. (Bare channels can be used for any application needing 5pin DIN connectors---like MIDI). See Channels and Line Types, G-Line Pigtails, and P-Line Pigtails. This is power delivered to a device thru its signal cable. This site talks only about phantom power for MIDI footcontrollers. Some have no dedicated power-input jack, and require phantom power thru the MIDI cable. More more, see the various types of MIDI Lines. A PedalSnake "PowerLine", that delivers power from your power supplies (at the backline), to your pedals (at the frontline). One P-Line is needed for each pedal voltage. P-Lines terminate in standard 2.1mm connectors (like power connectors use by Boss, Dunlop, etc.) Power Plug Adapters for pedals, and for power supplies will adapt 2.1 to other sizes if needed. This is the concept PedalSnake employs to make Base Snake channels configurable, because guitar rigs change so often. Pigtails plug into Base Snake channels to make G-Lines and P-Lines, and are easily swapped around. See Channels and Line Types. Another confusing name for power supply. Also see power plug adapters for pedals and supplies. Found on some pedalboards, this is a group of power-output jacks that feed power pedals with short power cables. Since the outputs are (usually) just a power-chain from one power supply, they are not isolated from each other, and can cause ground loops. So avoid purchasing pedalboards with patch bays. Power for you pedals is best designed using individual isolated supplies and power-chain cables. If you have a pedalboard with a patch bay, use it as long as their is no hum. See Avoiding Hum in Power Chains, and our Simple Hum Test. 2.1mm is the standard power plug size for pedals (Boss, Dunlop, etc, use this size). But there are other sizes out there that may require a power plug adapter, for pedals or supplies. For more, see Power Plug Sizes. Power supplies (for pedals) convert 120VAC wall voltage to a safer "low-voltage" (like 9VDC). The best ones are isolated Class 2 Transformers that help to avoid hum from ground loops. Also see "AC Adapters" (and other confusing names for Power Supplies, and Wall Warts. 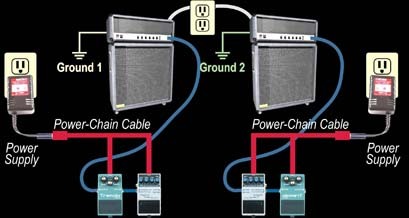 Chaining power to several pedals from one power supply, usually via a power-chain cable like our Vari-Chain System is the world's first power chain cable that can be configured to any length, and has all space-saving right-angle plugs. The chain of pedals that connects to your guitar (as opposed to, for example, an FX Loop chain). The primary chain usually connects to the amp input at the other end. It is important for several reasons: 1) It is considered to be primary ground, and serves as the ground reference for our simple Hum Test), 2) This chain is driven by the guitar pickup (unless an active pickup or wireless is used), so see True Bypass Truths, and 3) It (usually) goes into the front-end of an amp (as opposed to the FX loop). Also see Different Ground Points. The ground point at the metal surrounding the main single input jack of the main amp in the rig. To avoid ground loop hum, all other ground points in a rig should be compared to primary ground to see if any different ground points exist in the rig (see the Simple Hum Test). Also see primary audio-chain. In the guitar world, this can cause connections to fail. See Galvanic Corrosion. Single P-Line A P-Line Pigtail 2-Pack that provides only one P-Line, like MM1, MF1, and MF1-H. The 2-Packs always contain a 2.1mm male plug for the PedalEnd, and can have either a male plug or female jack at the AmpEnd, depending on what your power supply needs to plug into. A unique power supply from PedalSnake. To help tidy up backline wiring, instead of a messy cable and plug (like most wall warts), it sports a female jack in the chassis. 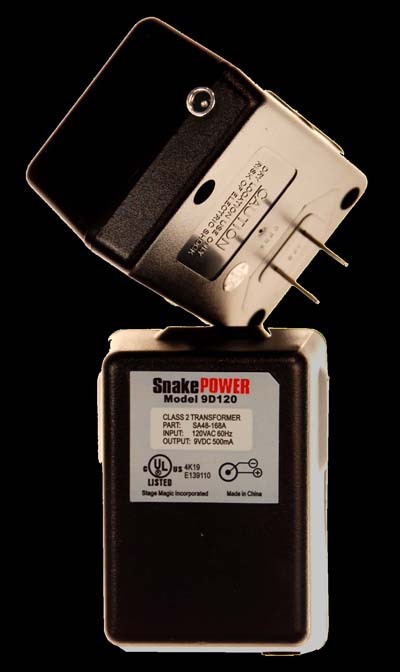 For ultra-quiet power, SnakePOWER is a true ground-isolated Class 2 Transformer, with a real heavy iron core. Rated at 500mA, it has the highest current rating in this class, making it the best choice for powering a dozen or more stompboxes. In fact, it is the only single-output, transformer-isolated "wall wart" (that we know of) that can power a Line 6 Modeler (like the DL4...just add 2125AR and 21RP power plug adapters). This is and easy way to get a quieter rig, and PedalSnake helps you do it. Plug your entire rig---all your AC-powered gear (amps, rack gear, etc) and power supplies---into the same AC power strip (PedalSnake makes this possible by having you move your supplies to the back with the amp). Having all this gear plugged into the same strip minimizes ground loop hum by putting everything at the same ground potential. Grounds can still vary in some rigs (see different ground points), but this is a good start. FX like delay, chorus, tremolo, etc., that change the sound over time. The opposite of gain-FX. To know how to best use them, see FX Loops and Pedal Order. A device used to induce a signal (or power) into a secondary coil from a primary coil, with no hard-wired connections (isolated). Usually used to: 1) Raise or lower (transform) a voltage, 2) Isolate a signal to prevent ground loops, or 3) To isolate a power supply from ground so it will adopt the ground of its target device and not cause a ground loop. This 2nd and 3rd are our primary concerns with guitar rigs. A pedal with no buffer circuit driving the "downstream" output cable when it is turned off. The input and output become hard wired together to pass the dry signal thru. The opposite of a buffered pedal. See True Bypass Truths. Determines which contacts in a barrel power connector are positive and negative (ground). For more, see Pedal Voltage Polarities. A power supply for an electronic device that is housed in a small box that plugs directly into the wall, so it looks like a "wart" on the wall. Wall warts for pedals, and other audio devices, are usually isolated, and will indicate such by saying "Class 2 Transformer" somewhere on the label. For more, see "AC Adapters" (and other confusing names for Power Supplies). wireless-out-and-back Sometimes wireless receivers sit back with the amp at the backline. So two long 1/4" cords are needed: one takes the guitar-signal out to the pedals at the frontline, and another returns the signal back to the amp-input. Because they use isolated power supplies, wireless receivers always have the same ground as what they connect to, so this is is a perfect application for PedalSnake's RS2 Dual G-Line (with its shared ground wire for the 2 sides). RS2 allows you to get both "cords" for wireless-out-and-back using just one BaseSnake channel.